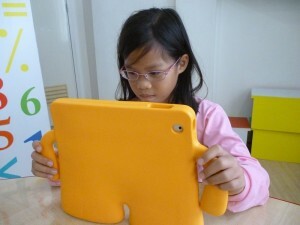 See how Mathemagis uses the latest in educational technology to make learning fun and effective. How difficult are the problems that kids can solve with Singapore Maths? Here’s an excerpt from a great article on Singapore Math from Education Leadership, a top journal from teaching and learning exerpts in K-12 education (download full article here). A man sold 230 balloons at a fun fair in the morning. He sold another 86 balloons in the evening. How many balloons did he sell in all? In Singapore, where 4th and 8th grade students consistently come in first on international math exams, students learn how to solve both problems using the same bar model technique. Students first encounter the technique in 3rd grade, where they apply it to very simple problems like the first one. In grades 4 and 5, they apply the same versatile technique to more difficult, multistep problems. By grade 6, they are ready to solve really hard problems like the second one. The Mathemagis program follows the same approach and teaches the bar-model method as early as Grade 2. Students progress to more complex 2 or 3 step word problems in the 3rd grade and do at least 4 to 6 steps by the time they are in Grade 5. Grade 5 word problems are equivalent to first year high school problems solved in traditional algebra classes. The bar-model allows the students to solve more complex math problems that requires algebra in the traditional curriculum. The foundation of analysis and visualization is laid in the primary grades and eases the transition to high school. Globally, boys do better than girls in math, with boys scoring 10.5 points higher than girls on average. However, in societies where boys and girls are treated equally, like Iceland, Sweden, and Norway, boys and girls perform equally well in math. This result suggests that any gender difference in math performance can be attributed more to nurture (e.g., education, resources, and opportunities) than to nature (intrinsic ability). In a New York Times article, Sol Garfunkel, the executive director of the Consortium for Mathematics and Its Applications, and David Mumford, an emeritus professor of mathematics at Brown, emphasize the importance of real world problem solving over abstract calculation skills. The Mathemagis program helps your child develop such problem-solving skills by emphasizing word problems and providing real-world context.